1 A None No Power Seat 1 A is a Business Class seat, although proximity to the galley may be bothersome. 1 C None No Power Seat 1 C is a Business Class seat, although proximity to the galley may be bothersome. 1 D None No Power Seat 1 D is a Business Class seat, although proximity to the lavatory and galley may be bothersome. This is a bassinet location so passengers traveling with infants are often seated here. 1 H None No Power Seat 1 H is a bulkhead seat, though proximity to the lavatory and galley may be bothersome. 1 K None No Power Seat 1 K is a standard bulkhead seat, though proximity to the lavatory and galley may be bothersome. 15 A None No Power Seat 15 A has extra legroom due to the position of the bulkhead. The tray table is in the armrest, making the armrest immovable and slightly reducing seat width. There is no floor storage for this seat during take-off and landing. 15 F None No Power Seat 15 F has extra legroom due to the position of the bulkhead. The tray table is in the armrest, making the armrest immovable and slightly reducing seat width. There is no floor storage for this seat during take-off and landing. 15 G None No Power Seat 15 G has extra legroom due to the position of the bulkhead. The tray table is in the armrest, making the armrest immovable and slightly reducing seat width. There is no floor storage for this seat during take-off and landing. 15 H None No Power Seat 15 H has extra legroom due to the position of the bulkhead. The tray table is in the armrest, making the armrest immovable and slightly reducing seat width. There is no floor storage for this seat during take-off and landing. 15 K None No Power Seat 15 K has extra legroom due to the position of the bulkhead. The tray table is in the armrest, making the armrest immovable and slightly reducing seat width. There is no floor storage for this seat during take-off and landing. 16 C None No Power Seat 16 C is an Economy seat, however this seat has limited under-seat leg and storage room due to the presence of an entertainment equipment box. 16 H None No Power Seat 16 H is an Economy seat, however this seat has limited under-seat leg and storage room due to the presence of an entertainment equipment box. 17 A None No Power Seat 17 A is a standard Economy seat, although proximity to the lavatory and galley may be bothersome. 17 C None No Power Seat 17 C is an Economy seat, although proximity to the lavatory and galley may be bothersome. 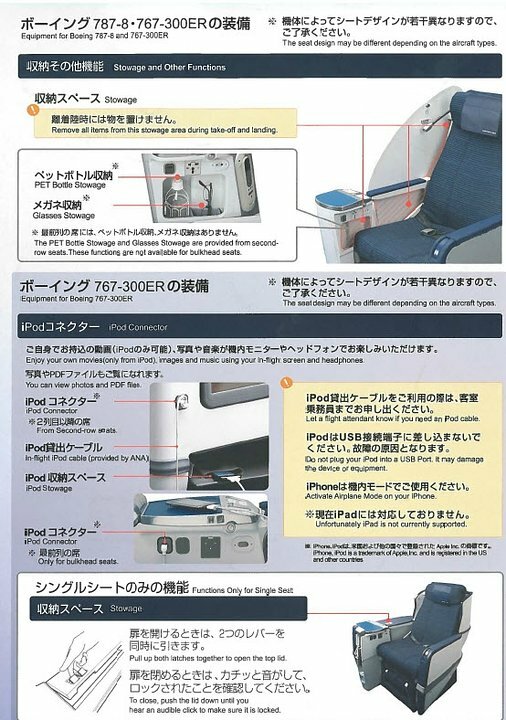 This seat has limited under-seat leg and storage room due to the presence of an entertainment equipment box. 17 D None No Power Seat 17 D is a standard Economy seat, although proximity to the lavatory and galley may be bothersome. 17 F None No Power Seat 17 F is a standard Economy seat, although proximity to the lavatory and galley may be bothersome. 17 G None No Power Seat 17 G is a standard Economy seat, although proximity to the lavatory and galley may be bothersome. 17 H None No Power Seat 17 H is an Economy seat, although proximity to the lavatory and galley may be bothersome. This seat has limited under-seat leg and storage room due to the presence of an entertainment equipment box. 17 K None No Power Seat 17 K is a standard Economy seat, although proximity to the lavatory and galley may be bothersome. 18 A None No Power Seat 18 A has extra room due to the exit. This seat may have a misaligned window. Proximity to the lavatory and galley may be bothersome. The tray table is in the armrest, making the armrest immovable and slightly reducing seat width. This seat has short armrest attached to the exit door which may be bothersome. There is no floor storage for this seat during takeoff and landing. 18 C None No Power Seat 18 C has extra legroom due to the exit row. Proximity to the galley and lavatory may be bothersome. The tray table is in the armrest, making the armrest immovable and slightly reducing seat width. There is no floor storage for this seat during takeoff and landing. 18 H None No Power Seat 18 H has extra legroom due to the exit row. Proximity to the galley and lavatory may be bothersome. The tray table is in the armrest, making the armrest immovable and slightly reducing seat width. There is no floor storage for this seat during takeoff and landing. 18 K None No Power Seat 18 K has extra room due to the exit. This seat may have a misaligned window. Proximity to the lavatory and galley may be bothersome. The tray table is in the armrest, making the armrest immovable and slightly reducing seat width. This seat has short armrest attached to the exit door which may be bothersome. There is no floor storage for this seat during takeoff and landing. 19 C None No Power Seat 19 C is an Economy seat, although proximity to the galley may be bothersome. This seat has limited under-seat leg and storage room due to the presence of an entertainment equipment box. 19 H None No Power Seat 19 H is an Economy seat, although proximity to the galley may be bothersome. This seat has limited under-seat leg and storage room due to the presence of an entertainment equipment box. 20 C None No Power Seat 20 C is an Economy seat, however this seat has limited under-seat leg and storage room due to the presence of an entertainment equipment box. 20 D None No Power Seat 20 D is a bulkhead seat, although proximity to the galley may be bothersome. The tray table is in the armrest, making the armrest immovable and slightly reducing seat width. There is no floor storage for this seat during take-off and landing. 20 F None No Power Seat 20 F is a bulkhead seat, although proximity to the galley may be bothersome. The tray table is in the armrest, making the armrest immovable and slightly reducing seat width. There is no floor storage for this seat during take-off and landing. 20 G None No Power Seat 20 G is a bulkhead seat, although proximity to the galley may be bothersome. The tray table is in the armrest, making the armrest immovable and slightly reducing seat width. There is no floor storage for this seat during take-off and landing. 20 H None No Power Seat 20 H is an Economy seat, however this seat has limited under-seat leg and storage room due to the presence of an entertainment equipment box. 21 C None No Power Seat 21 C is an Economy seat, however this seat has limited under-seat leg and storage room due to the presence of an entertainment equipment box. 21 H None No Power Seat 21 H is an Economy seat, however this seat has limited under-seat leg and storage room due to the presence of an entertainment equipment box. 22 C None No Power Seat 22 C is an Economy seat, however this seat has limited under-seat leg and storage room due to the presence of an entertainment equipment box. 22 H None No Power Seat 22 H is an Economy seat, however this seat has limited under-seat leg and storage room due to the presence of an entertainment equipment box. 23 C None No Power Seat 23 C is an Economy seat, however this seat has limited under-seat leg and storage room due to the presence of an entertainment equipment box. 23 H None No Power Seat 23 H is an Economy seat, however this seat has limited under-seat leg and storage room due to the presence of an entertainment equipment box. 24 C None No Power Seat 24 C is an Economy seat, however this seat has limited under-seat leg and storage room due to the presence of an entertainment equipment box. 24 H None No Power Seat 24 H is an Economy seat, however this seat has limited under-seat leg and storage room due to the presence of an entertainment equipment box. 25 C None No Power Seat 25 C is an Economy seat, however this seat has limited under-seat leg and storage room due to the presence of an entertainment equipment box. 25 H None No Power Seat 25 H is an Economy seat, however this seat has limited under-seat leg and storage room due to the presence of an entertainment equipment box. 26 C None No Power Seat 26 C is an Economy seat, however this seat has limited under-seat leg and storage room due to the presence of an entertainment equipment box. 26 H None No Power Seat 26 H is an Economy seat, however this seat has limited under-seat leg and storage room due to the presence of an entertainment equipment box. 27 C None No Power Seat 27 C is an Economy seat, however this seat has limited under-seat leg and storage room due to the presence of an entertainment equipment box. 27 H None No Power Seat 27 H is an Economy seat, however this seat has limited under-seat leg and storage room due to the presence of an entertainment equipment box. 28 C None No Power Seat 28 C is an Economy seat, however this seat has limited under-seat leg and storage room due to the presence of an entertainment equipment box. 28 H None No Power Seat 28 H is an Economy seat, however this seat has limited under-seat leg and storage room due to the presence of an entertainment equipment box. 29 C None No Power Seat 29 C is an Economy seat, however this seat has limited under-seat leg and storage room due to the presence of an entertainment equipment box. 29 H None No Power Seat 29 H is an Economy seat, however this seat has limited under-seat leg and storage room due to the presence of an entertainment equipment box. 30 C None No Power Seat 30 C is an Economy seat, however this seat has limited under-seat leg and storage room due to the presence of an entertainment equipment box. 30 H None No Power Seat 30 H is an Economy seat, however this seat has limited under-seat leg and storage room due to the presence of an entertainment equipment box. 31 C None No Power Seat 31 C is an Economy seat, however this seat has limited under-seat leg and storage room due to the presence of an entertainment equipment box. 31 H None No Power Seat 31 H is an Economy seat, however this seat has limited under-seat leg and storage room due to the presence of an entertainment equipment box. 32 C None No Power Seat 32 C is an Economy seat, however this seat has limited under-seat leg and storage room due to the presence of an entertainment equipment box. 32 H None No Power Seat 32 H is an Economy seat, however this seat has limited under-seat leg and storage room due to the presence of an entertainment equipment box. 33 C None No Power Seat 33 C is an Economy seat, however this seat has limited under-seat leg and storage room due to the presence of an entertainment equipment box. 33 H None No Power Seat 33 H is an Economy seat, however this seat has limited under-seat leg and storage room due to the presence of an entertainment equipment box. 34 C None No Power Seat 34 C is an Economy seat, however this seat has limited under-seat leg and storage room due to the presence of an entertainment equipment box. 34 H None No Power Seat 34 H is an Economy seat, however this seat has limited under-seat leg and storage room due to the presence of an entertainment equipment box. 35 C None No Power Seat 35 C is an Economy seat, however this seat has limited under-seat leg and storage room due to the presence of an entertainment equipment box. 35 H None No Power Seat 35 H is an Economy seat, however this seat has limited under-seat leg and storage room due to the presence of an entertainment equipment box. 36 C None No Power Seat 36 C is an Economy seat, however this seat has limited under-seat leg and storage room due to the presence of an entertainment equipment box. 36 H None No Power Seat 36 H is an Economy seat, however this seat has limited under-seat leg and storage room due to the presence of an entertainment equipment box. 37 C None No Power Seat 37 C is an Economy seat, however this seat has limited under-seat leg and storage room due to the presence of an entertainment equipment box. 37 H None No Power Seat 37 H is an Economy seat, however this seat has limited under-seat leg and storage room due to the presence of an entertainment equipment box. 38 C None No Power Seat 38 C is an Economy seat, although proximity to the lavatory may be bothersome. This seat has limited under-seat leg and storage room due to the presence of an entertainment equipment box. 38 D None No Power Seat 38 D is a standard Economy seat, although proximity to the lavatory may be bothersome. 38 G None No Power Seat 38 G is a standard Economy seat, although proximity to the lavatory may be bothersome. 38 H None No Power Seat 38 H is an Economy seat, although proximity to the lavatory may be bothersome. This seat has limited under-seat leg and storage room due to the presence of an entertainment equipment box. 38 K None No Power Seat 38 K is a standard Economy seat, although proximity to the lavatory may be bothersome. 39 A None No Power Seat 39 A is in the last row of Economy, and proximity to the lavatory and galley may be bothersome. 39 C None No Power Seat 39 C is in the last row of Economy, and proximity to the lavatory and galley may be bothersome. This seat has limited under-seat leg and storage room due to the presence of an entertainment equipment box. 39 D None No Power Seat 39 D is in the last row of Economy, and proximity to the lavatory and galley may be bothersome. 39 F None No Power Seat 39 F is in the last row of Economy, and proximity to the lavatory and galley may be bothersome. 39 G None No Power Seat 39 G is in the last row of Economy, and proximity to the lavatory and galley may be bothersome. 5 A None No Power Seat 5 A is a standard Business Class seat with a misaligned window. 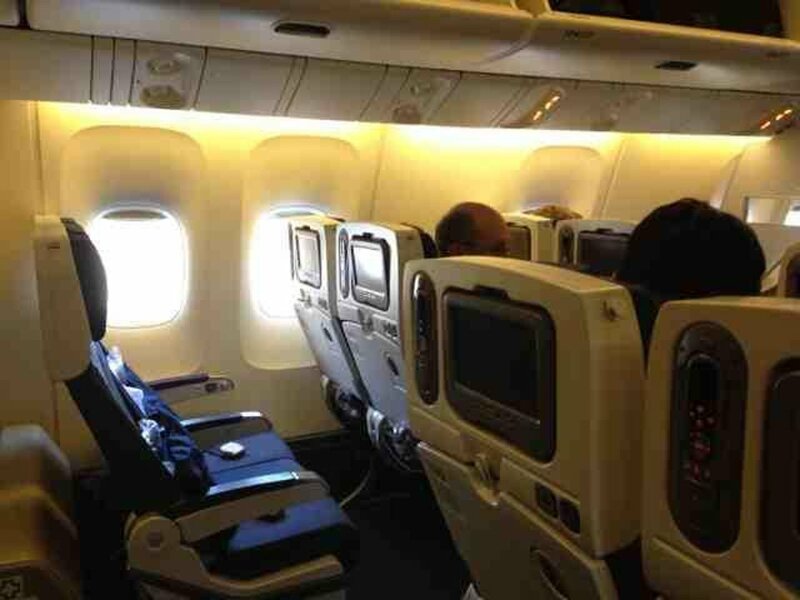 5 K None No Power Seat 5 K is a standard Business Class seat with a misaligned window. 7 A None No Power Seat 7 A is a standard Business Class seat, although proximity to Economy class may be bothersome. 7 C None No Power Seat 7 C is a standard Business Class seat, although proximity to Economy class may be bothersome. 7 D None No Power Seat 7 D is a standard Business Class seat, although proximity to Economy class may be bothersome. 7 H None No Power Seat 7 H is a standard Business Class seat, although proximity to Economy class may be bothersome. 7 K None No Power Seat 7 K is a standard Business Class seat, although proximity to Economy class may be bothersome. 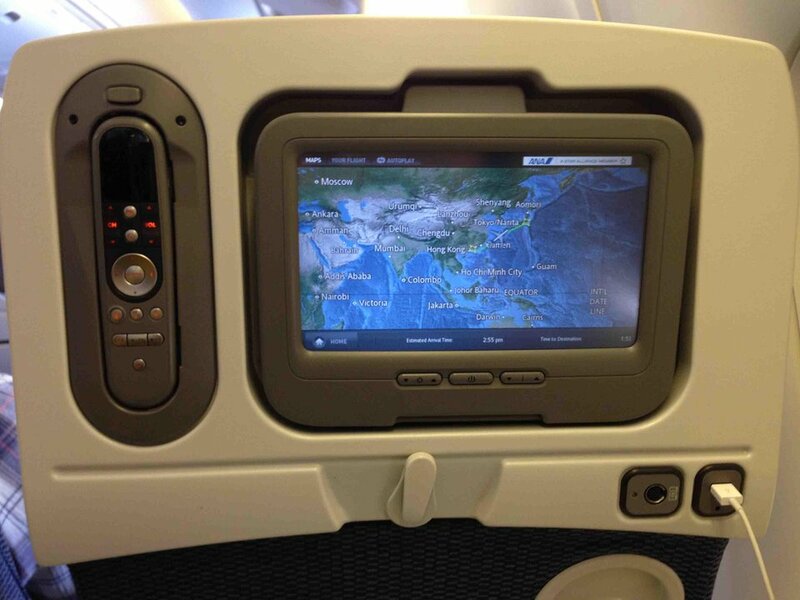 There are Universal Power PC power ports fitted to each seat in both Business and Economy class. Each seat also has an IPod connector and USB port. 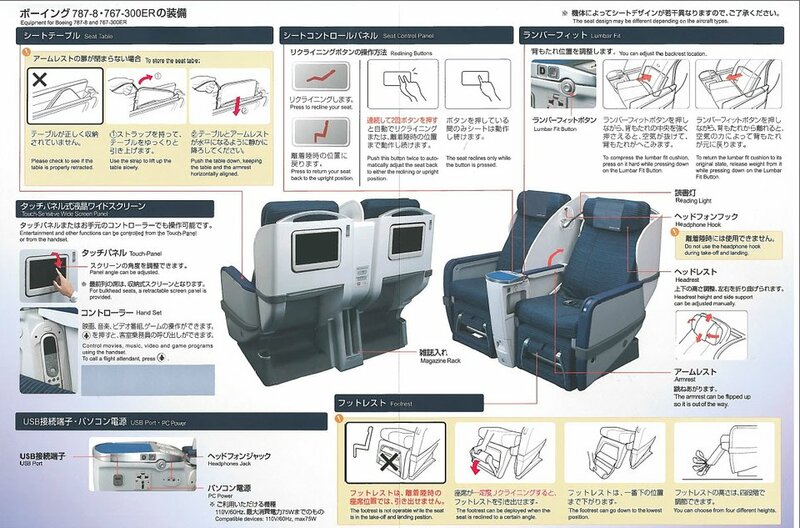 This is the newly reconfigured version offering both Business and Economy class seats. All Economy Class seats on this aircraft do not recline. 19C on this flight does have a metal In Flight Entertainment box that restricts legroom. Also, as stated, none of the seats in economy class recline. They are all fixed. I will avoid this airline and this plane in the future, if possible. Center seats in Business Class have limited foot space. 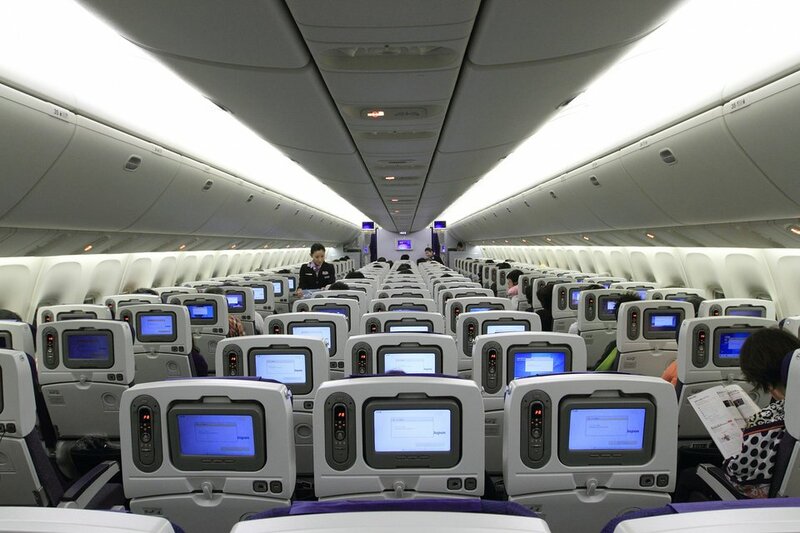 Seats are outdated recliner seats and video screens are barely bright enough to be viewed with normal cabin lighting. BEWARE!!! ANA is VERY militant about carry on size/weight. Was forced to check my carry on bag that was correct size, but slightly exceeded the weight limit. Will try to avoid ANA on future flights due to attitude about carry-ons and using phone during boarding. Interior seats are outdated and entertainment systems are 10 years behind the times. Flew the sector MNL/NRT and took the center seat as I was alone. The plane was immaculate and the idea of having a solo seat in the center is good - there is no one to stumble over or stumbling over you. The seat was reasonably comfortable but the aircraft one of ANA's older planes. The only negative comment I have is that the IFE system was an old version and some of the good movies offered across the ANA system were not available due to the system. Because the 767 lacks the width of the A330 or 777, it can be tight. And on this flight there were several 250+ pound people in business class who really seemed to have difficulty navigating the cabin and getting comfortable.